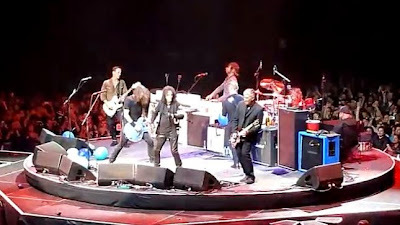 Alice Cooper was among the guest performers at head Foo Fighter Dave Grohl’s birthday bash in Los Angeles on Saturday. The Foos announced the music charity benefit show at The Forum with 3-days notice last week, inviting Cooper and several others – including David Lee Roth, Paul Stanley of KISS, Slash and Lemmy from Motorhead. Cooper spent the fall as the opening guest on the North American run of Motley Crue’s farewell tour. He hosted his annual New Year's benefit in Maui and returns to live action next month when he resumes shows on the Raise The Dead tour.